Hello good friends here I bring this plugin I hope you like first of all .. This plugin does the same thing but a user InsertMessage yesterday morning and told me that if you put different messages by default? osea a different one for each forum? And so for this I bring this plugin like to thank Santiago iso I get a small explanation of the styles (the best deal for the forums xD) ..
Well that makes DefaultEditor? What it does is that when activated create a field and table as they call in forums and messages to and you will see that says we click Default Editor and appear a table with 4 columns and down will all their forums! in the first column will leave the name of your forums, the second title in the third message default default and edit the last word! forum we want to put a title and / or message default when creating a topic click the edit word and we will put a text field where you enter the title and will enter a textarea where we have written the message when we click on save and the data will be then captured by going to that forum and click on create issue will come out the data in the default editor! 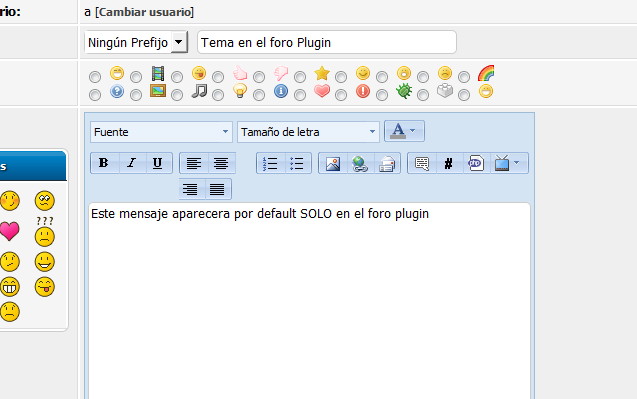 Hola amigos bueno aqui les traigo este plugin espero les guste primero que nada..
Este plugin hace lo mismo que InsertMessage pero un usuario ayer por la mañana me comento que y si quiere poner diferentes mensajes por default? osea uno diferente por cada foro? Y pues para ello les traigo este plugin agradesco a Santiago que me iso un pequeña explicacion de obtener los estilos (lo ocupe mejor para los foros xD)..
Bueno pues que hace DefaultEditor? Lo que hace es que al activarlo crea un campo y tabla como le llamen en Foros y Mensajes ay veran que dice Default Editor damos click y apareceran una tabla con 4 columnas y para abajo estaran TODOS sus foros!! en la primera columna saldra el nombre de sus foros, en el segundo titulo default en el tercero mensaje default y en el ultimo la palabra editar! en el foro que querramos poner un titulo y/o mensaje default al crear un tema pinchar la palabra editar y nos pondra un campo de texto donde ingresaremos el titulo y una textarea donde ingresaremos el mensaje cuando hayamos escrito damos click en guardar y los datos seran capturados entonces al ir a ese foro y dar click en creara tema saldran los datos en el editor por default! !